The album is accompanied by extensive liner notes, in a 28-page booklet that gives complete lyrics to each song and provides historical information that recounts the story of each song and its significance in the history of Ireland. For example, the lyrics to the popular ballad �James Connolly� are prefaced by an extensive biography of this famous Irish martyr of the 1916 Rising in Dublin, noting his role to the displaced Irish in Scotland, England, the United States, and Canada in the early decades of the twentieth century. Each story Warfield tells in his liner notes, as in live performance, is imbued with his personal touch, putting the history in context with anecdotes from his own life and those of his own ancestors. Any Irish music lover will find that the liner notes shed new light and an enhanced appreciation for the significance of Irish balladry as a vehicle for patriotism and collective national memory. 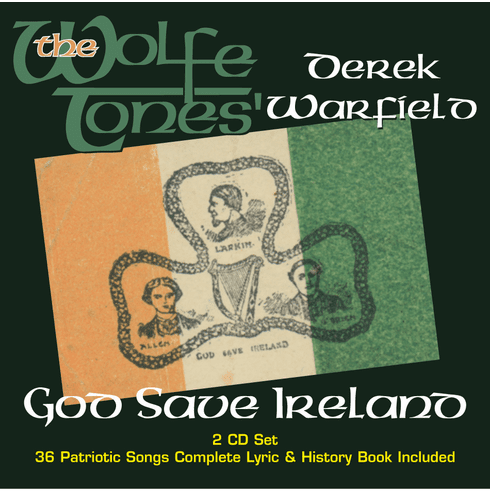 Warfield, a singer, songwriter, mandolin player, and noted historian, was a charismatic founding member of the celebrated Irish rebel songsters the Wolfe Tones. He is widely considered a seminal figure on the Irish music scene, and continues to tour the world, taking with him the story of Ireland�a story he has championed for more than 40 years. Accompanied by the Sons of Erin band, Derek Warfield's newest release is energetic and embued with the passion that has kindled his fiery ballad singing throughout his career. Personnel: Chris Kavanaugh, Pearce Warfield, Peter Wrafter, Derek Keane (vocals); Joe O'Rourke (guitar); Martin Cooney (banjo); Damaris Woods (tenor banjo); Seamus Shannon (accordion); Des Sheeran (bass instrument).